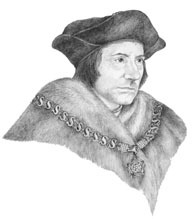 St. Thomas More, patron of statesmen and politicians, serves as a model of charity, courage, and fidelity for all seasons. Like Americans today, he was challenged in 16th century England to rise to the defense of his faith and the liberty of the Church. In the superb play and film, A Man for All Seasons by Robert Bolt, Thomas More is deftly portrayed as a martyr of conscience. He is unyielding in his stance against King Henry VIII’s move to divorce Catherine of Aragon to marry Anne Boleyn. Ours is a season in which Christians face the challenge of remaining true to the faith despite political pressure, the threat of sanctions, and the stigma of social ostracism. The HHS mandate is but one example. The reign of King Henry VII began with much hope for England. In fact More had called Henry “the everlasting glory of our time.” But gradually the situation deteriorated, and after 17 years on the throne and 17 years of marriage to Catherine, Henry began an affair with Anne. Nor was it his first affair. Determined to put Catherine aside and marry Anne, he asked the pope to declare his marriage invalid. For all seasons and for all peoples St. Thomas More is a model of patriotism, citizenship, and faith in action; God’s servant first. and is not frightened at the sight of sin.